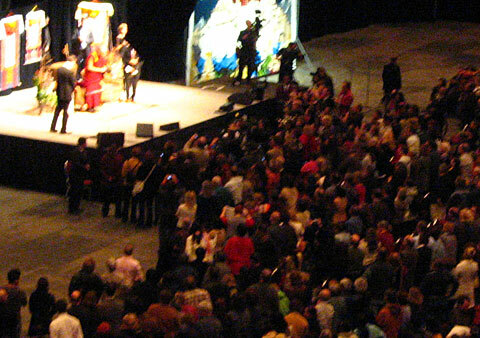 On Sunday, 28 October, 2007 his Holiness the Dalai Lama gave a public talk in the Civic Centre Arena, Lansdowne Park, Ottawa. The topic was ‘Global Citizenship through universal responsibility’. First of all Dalai Lama made himself comfortable and took off his shoes to sit cross-legged. Although the subject was quite serious he kept on joking throughout his speech in front of a couple of thousand people. He emphasized the indifference, which helps to be able to speak in front of that many people. In order to exclude wrong expectations he clarified that he is neither a healer, nor someone who can offer things to people. He said there is no difference between him and us who came to see him. Dalai Lama was talking about peace, and how everybody in his daily life can contribute to it. Non-violence, mentioning the example of the Chinese occupation in Tibet, compassion, trust and avoiding of anger are just a couple of keywords in his speech. This talk was not about religion, but about our behavior and the responsibility of each of us. He encouraged the crowd to experiment what he said, and in case they are not convinced to forget about what he said.